Seed Island-Bone 1.2.0 will first show you some beauties near the spawn. After that, you need to go a little further. Almost immediately you will see a beautiful cave, do not neglect it, even if it seems that it is very small and unremarkable. It has a lot of valuable resources. And if you have a goal to collect everything, then by all means look inside. This cave is located on a small plain. It would seem that there may be surprising? 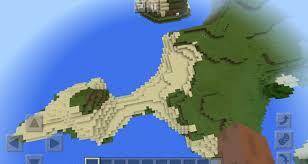 In Minecraft Pocket Edition before this time you could already see a smaller number of beautiful plains. But then there will be surprises in the form of an island that looks like a bone! You can not miss this for anything. And also make a couple of screenshots and brag with your friends, where you were and what you saw – true connoisseurs of square art will understand you perfectly well. The island itself not only looks like a bone, but also looks massive and stunningly beautiful. It is possible to build houses on it, to hold various pvp competitions and just be who you used to be in the MCPI. If you have installed a lot of mob mods before, it won’t be boring. Connoisseurs know how to combine not combinable! It is logical that the island will have many sandy beaches. And pretty pretty. It is also necessary to see with my own eyes, take a walk there, go to the forest there very close) and again find new caves. Take a look and in them – maybe, and there is a mass of valuable items or resources. We advise you not to build a house on the beach, but on a flat surface, using the extracted resources and new features that the new game client Minecraft PE gave you. Seed Island-Bone 1.2.0 will replenish the collection of your favorite locations and will become one of your favorites, where you can find so useful and beautiful at once.